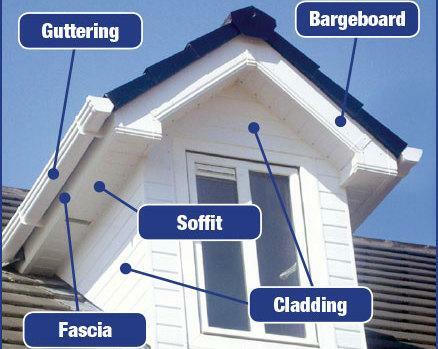 What exactly is our Fascias Gutters and Soffits Cleaning Service? This is generally all of the white plastic or wooden boarding just below the roof of your property, this is often white in colour and over time gets dirts and requires cleaning to keep your property looking its best. What is included in this as standard? All the Exterior of the Guttering Runs and Gutter Brackets. We clean the Fascias/Barge Boards right up to the Apex of your roof. What is not part of this service? We do not wash-down the interior of the gutter as this cannot usually be seen from the ground generally. Unless its low level guttering seen from an upstairs window. We can clean this on request but does not form part of the standard service. Clearance of the gutters. We offer a separate service for the Clear-Out of all Gutters and Downpipes please follow the link below to find out more. Cladding on the building, however this can be included should your property have cladding that is required to be cleaned.